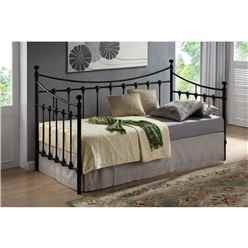 Black Paris Daybed Bed Frame - Small Single 2ft 6"
When selecting a Day Bed you will instantly have two choices either wooden or metal. 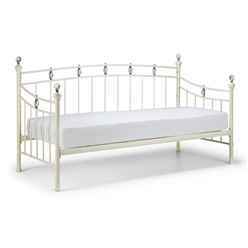 The metal Day Beds by far are the most popular as the choice and colour availability is greater. The Day Bed offers a unique look to any room setting whether it be in the lounge, hallway or the bedroom. 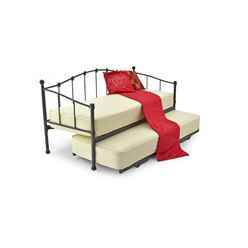 One of our most popular Day Beds is the Original Versailles Daybed Metal Frame which comes with an under guest bed. 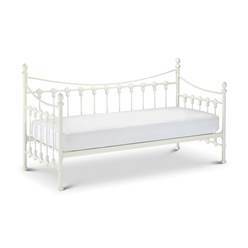 The Versailles Day Bed is only available in Glossy Ivory as researched showed that 92 % of the sales where in that colour when 10 other colours where offered. The other option is a wooden Day Bed. This can be either in a painted colour or a standard lacquer. As with the metal selection you have the availability of the under guest bed. 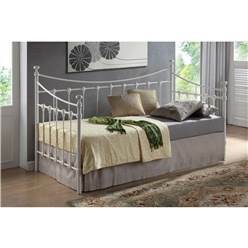 Currently white painted Day Beds are popular as the bed can be matched to most white bedroom furniture. If the under guest bed is not a requirement then perhaps a set of storage drawers might be a better solution if space is at a premium. With two large drawers underneath a lot can be hidden away in neat and tidy drawer. 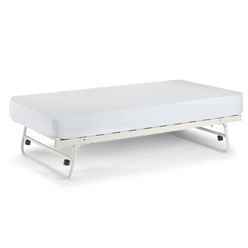 At iLikeBeds.com we have great knowledge on the different types of Day Beds we sell. If any information is required please call or email our sales team who are more than willing help.